Plant scientists have a new tool in their toolkit. The automated confocal micro-extensometer (ACME)–developed by a team of researchers in Europe and the US–allows scientists to measure spatial variation in the mechanical properties of plant cells with unprecedented accuracy. Plant cell growth is limited by the mechanical properties of the surrounding cell wall. Cell walls in the growing parts of a plant are thought to be much more extensible (stretchy) than those in mature parts, and these local differences in cell wall extensibility affect the overall shape of the plant. Until now, it was not possible to measure cell wall extensibility in the direction of growth in living plants. A team of researchers led by Cris Kuhlemeier of the Institute of Plant Sciences at the University of Bern in Switzerland created a system that does just that. 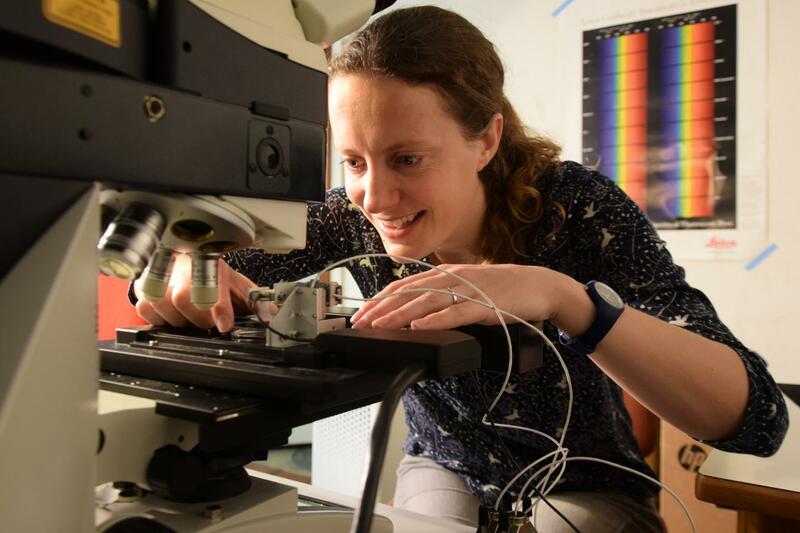 "Intuitively the simplest way to do this is to stretch the plant and look at how much each cell stretches," explains first author Sarah Robinson. Using this principle, the researchers cobbled together a robotic pipeline that combines custom and commercially available parts. They designed a specialized device that holds plants in place without damaging them and then stretches them under a defined pull. The device, which is mounted on a microscope, is controlled by software that allows the user to specify the duration and degree of stretching. High-resolution images of the plant are taken during stretching, and custom-built software uses the images to compute mechanical properties in different regions of the plant. The authors named the device ACME after the fictitious corporation featured in the Road Runner/Wile E. Coyote cartoons, because they were inspired by the tireless efforts of Wile E. Coyote. "Thankfully, in the end, we were more successful, but some of our prototypes were less elegant and involved a lot of scotch tape," jokes Sarah. Using ACME, the authors demonstrated that cells in the stems of seedlings exhibit a gradient of mechanical properties in the presence of the plant growth hormone gibberellic acid. Furthermore, they used their versatile system to show that stretching induces irreversible increases in cell length in living plant cells, but that the increases in cell length are partially reversed in dead plant tissues once stretching stops. While ACME was built to accommodate small samples–the specimen used in this study was a tiny weed known as thale cress–it can readily be adapted for use with larger samples and different imaging systems. The team has made all the information needed to create this system freely available, so that plant scientists in other labs can use ACME in their own research. "ACME has many applications and scope for future use," says Sarah Robinson. For instance, this device can help us understand the mechanisms by which various inputs and treatments alter plant growth at the cellular level. Furthermore, it might elucidate conditions and treatments that promote plant cell wall extensibility, and thus enhance plant growth at the cellular level. Given the escalating demands for biomass production, this is a very exciting prospect.